The 2018-2019 NBA basketball season hasn’t gone as planned for a number of top teams. One month into the season the Boston Celtics were struggling to get above .500 in the Eastern Conference. Out West, the Golden State Warriors were trying to find some firm footing after a substandard start and at 14-7 found themselves tied with the Los Angeles Clippers and just ½ game ahead of the Denver Nuggets. The Memphis Grizzlies, Oklahoma City Thunder and LeBron James’ Los Angeles Lakers were all less than 2 games back of the defending champs. We’re now well into the second half of the season and some sanity has been restored. Well, at least to some degree—the Milwaukee Bucks have the best record in the league (35-13 as of 1/28/19) and show no sign of letting up winning 8 of their last 10. They need to keep that pace as the Toronto Raptors are right behind them at 37-15 and have won 7 of 10 as of this writing. Curiously, the Bucks are only the third choice to win the Eastern Conference. The Raptors are the top choice at +200 with the Celtics right behind at +230. The Bucks are +375 which is just ahead of the Philadelphia 76ers at +400. These are the only teams at single digit odds in the Eastern Conference betting market. The next team on the ‘hit parade’ is the Indiana Pacers at +1800. In the Western Conference, the Golden State Warriors are -305 to earn another NBA Championship berth. The Houston Rockets are the second favorite at +850 despite the fact that they’re currently ranked fifth in the Western Conference 6 games back of the lead—and the only team besides the Warriors priced at single digits. The third choice in this market is the Oklahoma City Thunder (+1300) followed by the Denver Nuggets (+1400) and the Los Angeles Lakers (+1500). The pricing on the Lakers is interesting since things haven’t been going well for the purple and gold. LeBron James has missed some time due to injury and although he’s nearing a return his team is currently out of a playoff spot. Were the season to end today the Lakers would finish in 9th place, 9.5 games back of the Warriors and 2 games back of their crosstown rivals the LA Clippers. No surprise that the Golden State Warriors are favored to win their third straight NBA title and fourth in the past five years. The Warriors are a -200 favorite to claim the championship with only the Toronto Raptors (+900) priced at single digits. The Boston Celtics are +1100, the Houston Rockets +1300, the Milwaukee Bucks at +1500 and the Philadelphia 76ers at +1600. With the exception of the Oklahoma City Thunder (+2200) every other team in the league is at 25 to 1 or higher. Thirteen teams are given odds in excess of 100 to 1 to win the NBA championship with the biggest longshots being the Chicago Bulls, Cleveland Cavaliers, New York Knicks and Phoenix Suns all at a mind boggling +300000. Some books are offering an early line on the NBA Championship series based on conference. Currently, the Western Conference is a -300 favorite with takeback on the East at +250. 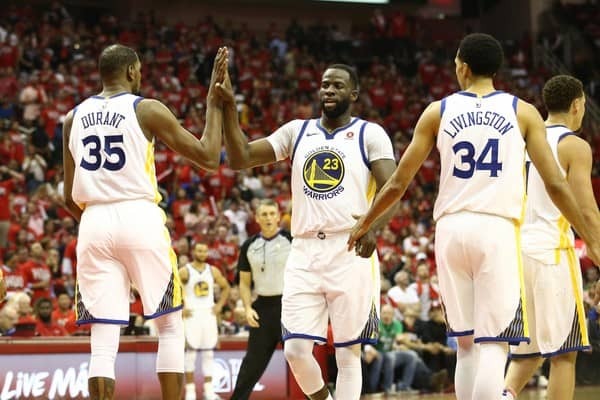 This is something of a ‘sucker bet’–if you’re confident that the Warriors are going to win the Western Conference you can find them at a much better price. If you’re not, you can get a better price by betting on one or more of their challengers such as Houston at +850.